The Ambassador of Israel to the Philippines, Effie Ben Matityau, noted that the increase of tourists influx is due to Filipinos looking for trips that would also satisfy their cultural and spiritual cravings. Israel is also known for adventure, excitement, natural wonders, and being the land of creation and innovation. 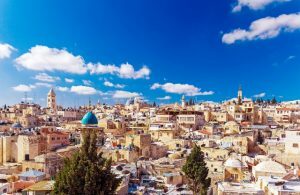 According to Israel’s Ministry of Tourism data, 9,000 Filipino travelled to Israel during the first half of 2017, a 62% increase from last year’s 5,600. April 2017 also recorded the most number of Filipino tourists in Israel at 2,100. In June, Israel saw 1,200 Filipino tourists, a 100% increase from 600 in June 2016. Hassan Madah from the Israel Ministry of Tourism, who operates in India and the Philippines, hopes that the number of Filipino tourists travelling to Israel will reach 17,000 this 2017. Meanwhile, Israeli tourists flow into the Philippines reached 16,725 last 2016, according to data from the DOT, a 42% increase from 2015’s 11,756. The Ambassador said that the growth rate of Filipino tourists in Israel and Israeli tourists in the Philippines will be roughly the same.